This ornate Victorian property houses sensitively modernized offices with meeting facilities and comprehensive reception services. 24 hour access is granted and the property stands in a quiet area, a stone's throw from Surbiton station and local amenities. 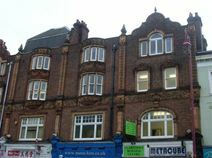 This centre is conveniently close to the A3 and Surbiton Railway station and is near to a good range of shops and eateries. It offers unfurnished offices on flexible terms to suit the needs of your business.